Safariland's 6520 TASER® Duty Holster with SLS is designed to carry TASER® X-26 and M-26 electronic discharge weapons securely. It includes their signature Self Locking System, which provides a high level of protection against unauthorized access to weapons without sacrificing a smooth, rapid draw when needed. The top hood must be released in a simultaneous down and forward motion in order to access the EDW, preventing takeaways and reducing the likelihood of accidental release compared to traditional thumb breaks. The shell is made from tough, rigid SafariLaminate STX in your choice of four different professional finishes. The clip-on SLS loop adjusts to fit belts from 1.5 to 2.25-inches wide and can be worn either strong side or crossdraw in multiple carry angles for the best fit with the rest of your loadout. Great holster, as usual from Safariland, the only thing i don't like is the clip - I prefer the drop holster mount. 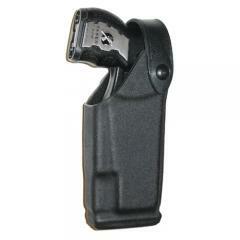 Great CEW holster for the Taser X26P. Similar unholster as pistol. Good for muscle memory. This holster works very well. This is a great holster. Only recommendation I would make is get the hood with it. I have found that my vest will push and open the thumb break. Will this hostler work for the X2? Is this a leather or plastic hostler? Yes, it will fit the X2 and it is made from molded plastic material.